April 20, 2018 – Kansas City – Boulevard Brewing Company today announced that its long-awaited canning line has been installed and fully commissioned. 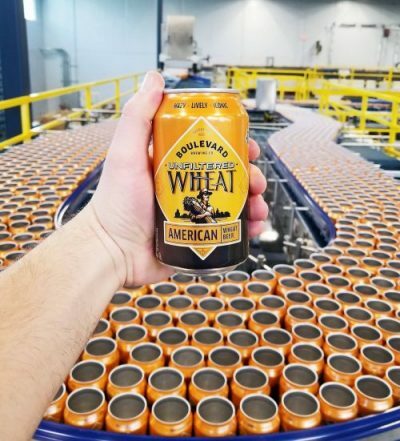 The $10 million project consists of a 24,000 square foot Canning Hall adjacent to the brewery, housing a high speed line capable of filling up to 350 12-ounce cans per minute. Engineered with flexibility in mind, the line is able to produce a variety of can sizes and package configurations. Finkle + Williams served as project architect. Kansas City-based MillerStauch Construction was general contractor. Key equipment and operational expertise was supplied by Krones AG. The can line is already producing 12-packs of KC Pils and Pale Ale, the two newest additions to the portfolio. Seasonal offerings of Hibiscus Gose and Berliner Weisse will be can and draft exclusive. Other beers available in aluminum cans include Unfiltered Wheat, American Kolsch, Jam Band, Tropical Pale Ale and Ginger Lemon Radler.